Nothing will transform your garden faster than the professional gardening services which Top Gardening Services London offers. They are better than any others you've tried before not just because they have considerably low prices, but also because they are performed only by highly qualified specialists. The gardeners of this agency have been working in the industry for many years, so you can be a 100 % sure that they will be able to take care of your garden. 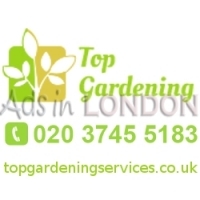 It is easy to find them because the head office of Top Gardening Services London remains open during the entire week. This includes also the weekends and the holidays.